Property 52: Updated condo with shared pool & hot tub - walk to the gondola & restaurants! 2 Bedroom Retreat in the Moose Capital of Colorado! Property 55: 2 Bedroom Retreat in the Moose Capital of Colorado! Keystone Newly Renovated Condo- New Owners, Great Rates! Easy access to slopes! Property 65: Keystone Newly Renovated Condo- New Owners, Great Rates! Easy access to slopes! Winter Park Studio Condo - 5 Mins to Downtown! Property 67: Winter Park Studio Condo - 5 Mins to Downtown! Property 71: A Pleasant Cabin in the Heart of BV! Property 73: LoHi Apartment w/Patio -1 Mile to Downtown Denver! Newly Renovated Condo, Ski-in, Walk to Town, Perfect Location! Property 74: Newly Renovated Condo, Ski-in, Walk to Town, Perfect Location! Property 83: Grand Lake Condo-7 Miles to Rocky Mtn. Natl. Park! Property 86: Updated condo with shared hot tub, pool & sauna - walk to the gondola! NEW! Winter Park Studio w/Hot Tub - Walk to Lifts! Property 87: NEW! 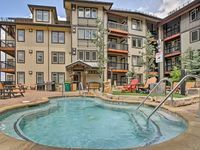 Winter Park Studio w/Hot Tub - Walk to Lifts! Property 92: NEW! Colorado Springs Home w/Hot Tub-1 Mi to DT! Location, Location... Across Street From Base Of Peak 9, Right In Town! Property 94: Location, Location... Across Street From Base Of Peak 9, Right In Town! Deer Cozy Cabin by the Big Thompson River, Near R.M.N.Park. Property 96: Deer Cozy Cabin by the Big Thompson River, Near R.M.N.Park. Property 99: NEW! Ouray Condo w/Patio 1/2 Block to Main Street! My husband and I enjoyed our weekend getaway at this lovely cottage within walking distance to downtown. Just enough room for the two of us, had everything we needed. Would definitely stay there again. We had an awesome time in Winterpark. The unit was clean and comfortable and all we needed for our short stay. Would definitely go back.